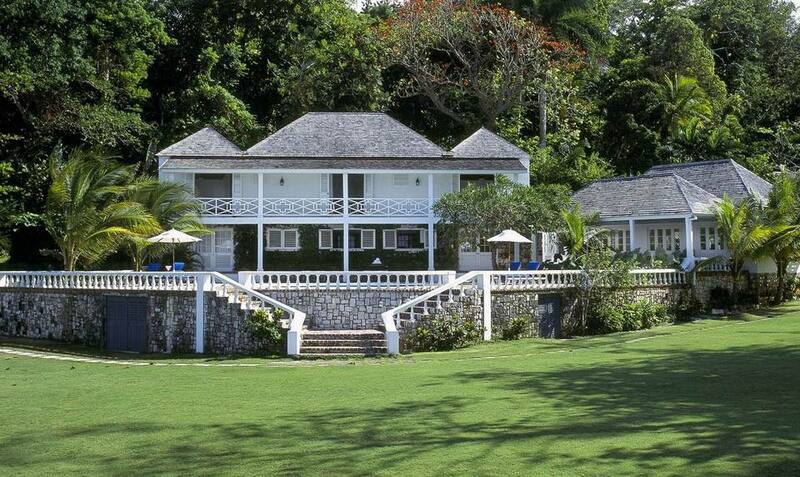 Round Hill is a casually elegant boutique hotel and spa in Montego Bay, Jamaica, with a celebrity clientele that dates back to its beginning in 1953. John F. Kennedy, Paul Newman, and Paul McCartney have all stayed here, and Ralph Lauren owns one of the 27 villas overlooking the ocean. This small luxury property is easy to get to because it's just 20 minutes from Sangster International Airport, but it feels a world apart. First, Round Hill set on its own 30-acre private hillside peninsula and commands the shoreline. It's not one of a string of hotels on a wide sandy beach, with strangers walking up and down all day, like you would see in Negril. The people who you see are the people who are staying there. Round Hill does have a neighbor - an 18th century plantation house that you reach by walking a path along a stretch of rocky shoreline. But it came up for sale a few years ago and is now the Spa at Round Hill. The atmosphere makes it one of the stand-out spas in Jamaica. You can get treatments, take a yoga class, eat lunch, lay in a hammock, sit in lawn chairs under the trees, or go for a swim in the ocean. The hotel was first opened by a socially connected Jamaican entrepreneur, John Pringle, who invited American and European socialites, literati and artists to build private cottages on the property. Old black and white photos in the public areas attest to its old-school glamour. Today, you can book a villa when the owners aren't in residence, or one of the 36 guest rooms in The Pineapple House, a long two-story building that hugs the shoreline. Ralph Lauren himself tastefully designed the rooms, using neutral whites and splashes of bright pink or blue. I stayed in one of the upstairs rooms, which have romantic four-poster beds, vaulted ceilings and large louvered windows which fold back so that you can see the ocean. This is a delicious place to sit and relax. The downstairs rooms don't have the high ceilings, but have a patio. The rooms are so close to the sea that you can hear soothing waves lapping at the shores. Round Hill is all about good taste and a quiet, laid-back style that hearkens back to another era. Rooms are still opened with actual keys, and the brass key chain is embossed with the signature Round Hill pineapple. Round Hill serves an English high tea every afternoon, with sandwiches and sweets. This is not an all-inclusive party scene, but a low-key place to relax and restore. Europeans like it here. There is a complimentary Pineapple Kids Club that can accommodate all ages. If you want adventure -- and there is plenty to do in the area -- you might want to go off-property. While there are tennis courts, jogging trails, and a fitness center, I mostly saw adults laying around by the infinity pool, relaxing. It's so laid back that the spa director said that some people think it's too far to walk over to the spa! And it's literally a five-minute walk. While she's willing to send a therapist to you, missing out on the spa would be a mistake. It truly has a stunning setting -- a seaside plantation house with a sweeping lawn and giant trees. You don't even have to get a treatment to enjoy this spot. The Spa at Round Hill uses Elemis products, but I found out that they also make their own blends of massage oils, using essential oils of Jamaican lemongrass in one and sweet orange and lavender in another. Usually the oils are only available for their signature hot stone massage ($150 for 50 minutes), but I asked if they would use the lemongrass oil for my deep tissue massage ($150 for 50 minutes) and they accommodated me. One of the interesting things about Round Hill is that it didn't have a lavish locker room. Instead your therapist takes you to a small ante-room that has a basket filled with your robe and slippers, a door to a bathroom and shower, and another door to your treatment room. That's where you get ready for your treatment. As I like to take a shower before my massage, I felt a bit rushed, like it was cutting into my treatment time. My therapist was very strong, and I had to ask her for a medium massage instead of the deep tissue I booked. She used massage techniques, like stretching and hacking, that are highly effective but not typically used at American resort spas. Round Hill Spa is also known for its body treatments, including a Jamaican Coffee Bean scrub, sweet vanilla and brown sugar body scrub and a pineapple body buff. I didn't get one but heard they are excellent. Caribbean travelers are known for over-indulging, so one of Round Hill Spa's signature treatments is the Hangover Massage. It's a fairly gentle massage that combines classic Swedish massage with an oil blend that include Jamaican Sweet Basil to stimulate your immune system and help detoxify the body. Just don't expect miracles if you had too many of the resort's fabulous rum punch. Round Hill has an outdoor treatment room surrounded by tropical jungle. I climbed the tantalizing stairway to take a peek, and saw it's equipped with a vichy shower, one of my favorite treatments. While this area is primarily for body treatments, you can sometimes use it for other services if it's not booked. For instance, some was getting a Reiki treatment up there simply because they requested it and the room was available. A good yoga class is taught here for an additional fee. A limited menu is served at the spa, and I highly recommend you take some time to eat, hang out in a hammock, and look at the ocean. The waterfront lawn is also used for waterfront massages. Despite all the luxury, there is a laid back feeling here at Round Hill, and it extends to the service. It is cordial but won't be scripted like American corporate hotels. The weakest point is the fine dining experience. But the English-style high tea at 4 pm., with excellent home-baked goods, was superlative. All in all, it's a hotel and spa that is highly recommended.